The Cape Cod catboat has graced the waters of New England since the mid nineteenth century. Originally designed and sailed as rugged yet accommodating work boats, their stout construction and rig could withstand the tough proving grounds of the waters off Cape Cod and beyond. Strong winds, tides and treacherous shoals demanded a design which would stand up to these conditions, yet sail fast and provide enough room to carry a large payload. Throughout the early years yachtsmen watched these sturdy craft ply the waters with grace and speed in a wide variety of conditions and by the late 1800’s a number of shipwrights were building catboats for the sole purpose of racing. However, by the mid 1900’s, more modern sailing designs had decreased the popularity of catboat racing and more reliable engines had decreased the efficiency of sail boats as working craft. Many people felt that the catboat had outlived its purpose. Fortunately, Breck Marshall did not subscribe to that theory. In 1962 he undertook an exhaustive study to create a “modern day” catboat that would incorporate all the best features of these historical craft; stability, speed, spacious accommodations, shallow draft and classic beauty. His goal was to produce an affordable catboat with exemplary sailing characteristics and by using the relatively new technology of fiberglass construction, make them easier to maintain than their wooden predecessors. The result of his labor was the Marshall Sanderling. The early years were a bit rough for Breck. Many traditional sailors were not very approving of the classic catboat being built in fiberglass. Yet he remained persistent. He entered the Sanderling in as many catboat races that he could and was consistently placing in the top three spots and usually in first. Within a few years the virtues of the Sanderling were becoming apparent and more and more orders were placed for new boats. Nearly 50 years and more than 800 Sanderlings later it is evident that Breck’s vision of the “modern” catboat was a success. With the popularity of the Sanderling on the upswing in 1965, Breck expanded the Marshall fleet to include a comfortable, shoal draft family cruiser, the Marshall 22. Building on the reputation of quality construction and strong sailing characteristics, the appeal of this boat was strong from the start. To date we have produced over 275 of them. 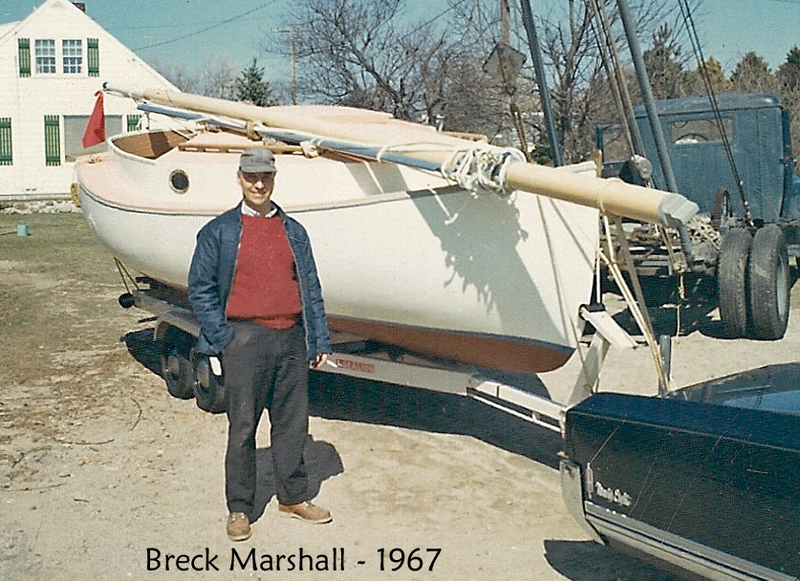 To round out the line of Marshall Catboats, Breck developed the 15 foot Sandpiper in 1972. The lines were a scaled down version of the Sanderling and she proved to be as nimble and comparably stable as her larger sisters. Like the Sanderling, the Sandpiper quickly established herself as an accommodating family boat and the appeal as a one design race boat soon followed suit. In the nearly 40 years since the first Sandpiper was built we have produced almost 600 of them for owners throughout the US and overseas. In 1976, Breck expanded the lines of the Marshall 22 to create the Marshall 26. The idea was to create a larger cruising catboat with standing headroom. While it did have plush accommodations by catboat standards, the cost of production was very high and some of the aesthetic appeal was lost. Therefore it was a difficult boat to market and only two were produced. 1976 was also the most difficult period in Marshall Marine’s history. Breck’s sudden passing shook much of the good will and customer confidence that he had built over his career. He was the face of the company and without that recognition, some orders were cancelled and new orders were scarce. His wife, Sarah, and his business partner Bill Pinney were determined to keep the company moving forward and with the help of John Garfield, who was hired in 1973 to help with sales and production, they worked hard to gain control of the operation and get it back on track. Within a year John became the general manager and Sarah stepped back from the day to day operations. Once things were back on a more even keel, catboat sales became very steady again. John managed the operations very efficiently while continuing to pay close attention to quality and detail. In 1986 Sarah and Bill recognized John’s dedication to Marshall Marine and sold the business to him. His expertise in all aspects of the business served the company well and for many years John promoted the boats admirably. He developed a great rapport with thousands of cat boaters over the years and was always a strong proponent of the camaraderie that exists among the owners of these unique boats. While I hadn’t worked in the family business, I had been working in the marine industry since the mid 1980’s as a boat builder, rigger, yacht captain and customer service manager at another boatyard. I had also obtained a degree in naval architecture from Maine Maritime Academy. John had been a good sounding board for me during these years and after numerous discussions we came up with an idea. John wanted to plan his retirement and I was looking to own a business in the marine industry. This appeared to be a natural fit and in 2001 I came to work at Marshall Marine. The idea was for me to learn as many aspects of the business as possible and then purchase it from John. After five years under John’s tutelage, I, along with my wife Kristen, purchased the company and the business was back in the Marshall family. I am very grateful to John for this opportunity and for all his help and continued support and friendship. To date, Marshall Marine has produced over 1,800 catboats. My goal is to maintain the same standards of quality construction that Breck set down in 1962 and look for ways we can improve our boats wherever possible. Constructive feedback from current Marshall Cat owners is always appreciated, and taken into consideration. We look to expand on this rich history and maintain the catboat’s standing as the classic American sailing craft that it is.